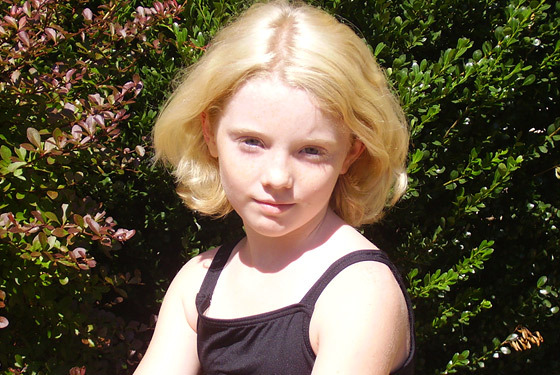 Rachel Shrader was so close to being Florence in, Kit, An American Girl Mystery. She had gotten her fourth call back, and that was probably the end. Erin Hilgartner has taken that role, the role she had longed to do. Susan Avery has interviewed this young actress in New York Magazine, the interview is below. We had to go into a room at the American Girl store and study our lines. There were about twenty of us who were the finalists from around the country, like Colorado, Orlando, Pennsylvania. Yes, I went in alone. No one noticed, but I picked my cuticles, which is what I do when I’m nervous. What role did you try out for? I was trying out for Ruthie, but one of the casting directors came up to me and said, “You look like Florence,” and she gave me the script. Florence is the younger sister. She wants to get into this club, but every time she tries, something gets messed up. I identify with her because I’m a younger sister, and I know what it’s like when stuff keeps getting in your way. This movie is about the Great Depression. Do you know what that is? It was in the thirties, and banks took away people’s money, furniture, houses, and businesses. I’m anxious. If I don’t make it, I’ll be disappointed, but I won’t break down totally. But if I do make it, I have to be in Toronto by May 29 for filming. It would be such an overload, I might freak out, which I do sometimes. Other times I just go with the flow. Yes and no. Some of the girls had amazing expression that I don’t think I can beat. But I was the only light blonde. August 22, 2007. Cool Things To Know.